Publisher: EA. Developer: Magnetic Fields. 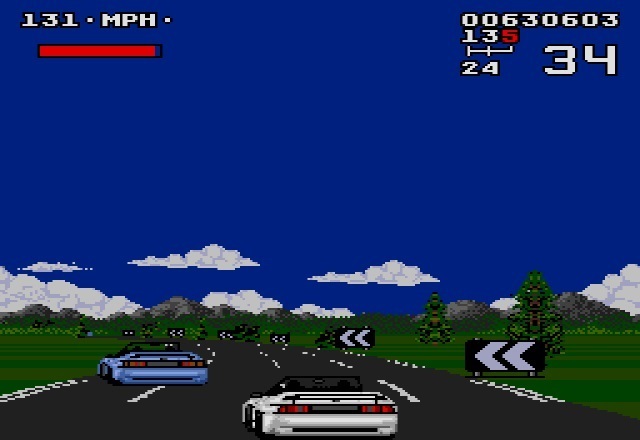 Lotus Turbo Challenge marks a fascinating waypoint in the transition of the racing genre during the 16-bit generation. 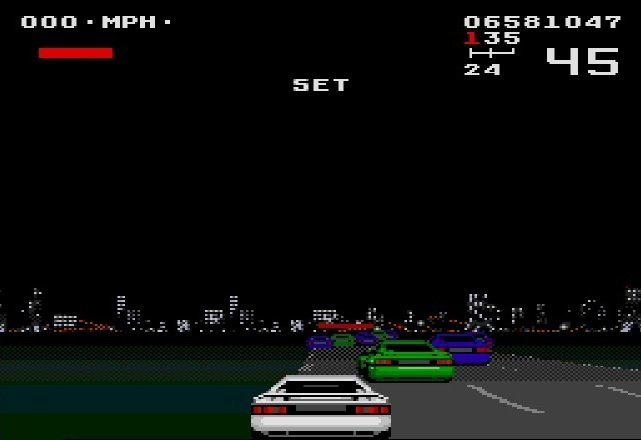 It sits between the uncomplicated, race-against-the-clock arcade coin-guzzlers of the eighties, and the emerging breed of sim-leaning, built-to-last racers that would become increasingly prominent over the first three or four years of the nineties. 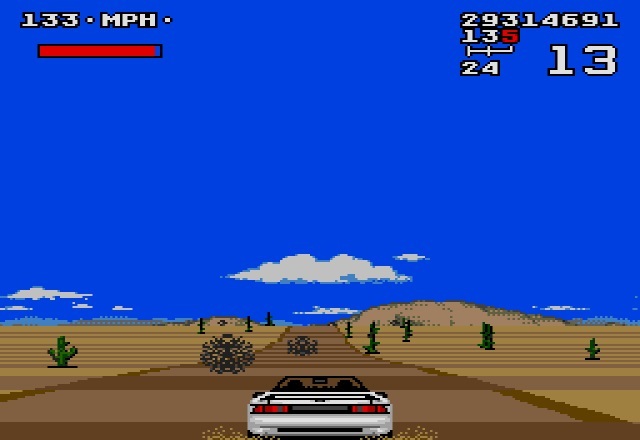 Magnetic Fields’ racer (the first Mega Drive entry in the series though also known as Lotus Turbo Challenge II on other platforms) offers a silky-smooth driving experience as well as one of the finest examples of split-screen two-player racing around at the time, though the joyride is curtailed somewhat by a lack of long-term appeal. It runs like an absolute dream on the Mega Drive. Scintillatingly fast, unerringly smooth, LTC positively shows off with its myriad of sweeps, undulations, tunnels and environmental effects. The handling is absolutely outstanding, sweet as a nut, with a feel that is so precise you can feather the throttle through corners, changing your line so as to pass cars on the in or outside, and dart lithely between them on the straights. Like EA’s other racing kingpin of the time, Road Rash, LTC focuses on a smallish number of lengthy tracks that last for several minutes. As in rallying, the circuits move from A to B without looping, and there’s a sequence of tight but fair time-checks that must be met in order to continue. There’s a great (and by 16-bit racer standards, relatively unusual) sense of variety to the courses that isn’t limited to an occasional change of backdrop; it’s also the way the car behaves and the challenges each track throws up. The forest opening gives you a good idea of a neutral, grippy tarmac feel, but as soon as you’ve got the hang of this, it’s already testing you in different ways. Next up is a night race amidst city surrounds with limited visibility; this is followed a foggy rural track on narrow roads. Then the environments start to tangibly affect the car; an icy course results in light, nippy handling, whilst the dustbowl desert has the opposite effect with lethargic steering and slow acceleration, meaning that gaining momentum – and maintaining it – are of the upmost importance. Gah! Invasion of the giant hairballs! The most brilliantly devious (though not the hardest) location of all perhaps is the Interstate, which consists of two narrow motorway lanes, generally separated by bollards. Stick to the right side of the road and you’ll run the risk of being stuck behind traffic, all the while aware that your precious time is ebbing away. Risk the left however and you’ll have fewer targets but, well, they’ll be heading straight at you. 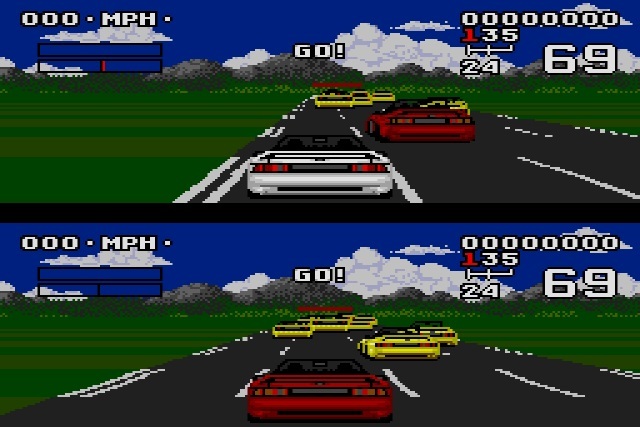 Being hyper-critical, it could be argued that Lotus Turbo Challenge becomes less of a racer and more of an obstacle course in later stages, but there’s no question each level comes to offer a unique challenge. The desert sees you weaving around bits of tumbleweed, whilst it’s important to miss patches of ice mid-corner during the snow level. There’s even a bonkers Marsh stage which encourages players to drive straight into overturned trees in order to jump the occasional water hazard. It’s a very classy product, with the slick game engine aided by similarly luxurious visuals and decent sound. 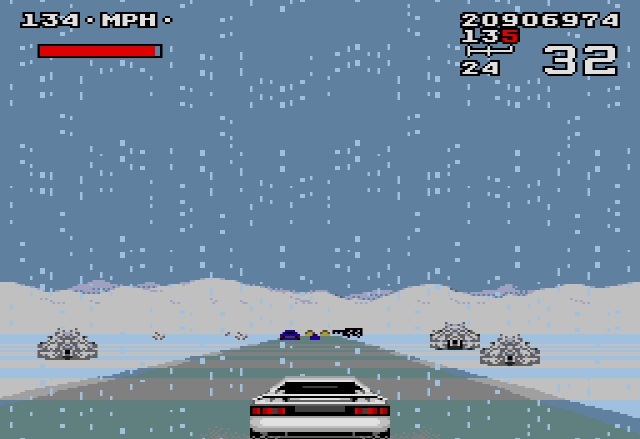 There are ample amounts of trackside scenery, whilst the sensation of speed and scrolling are some of the most convincing on any 16-bit racer. The cars look pretty good, the engine notes and tyre screeches are relatively decent and there’s the odd instance of adrenalin-fuelled driving music to get you in the mood. Oh, and how could I forget. Tapping C yields the seminally awesome call of “yee-haw!” which can be hammered away at to your heart’s contend. As ever though, it’s best to use it when flying past a mate in two-player for maximum smugness. The eight circuits are crackers, and the password system is a welcome one, though LTC’s linear method of progression and lack of difficulty settings means it’s likely one you’ll play for days rather than weeks or months. Five or perhaps six of the tracks can be polished of in the first day or two, and short of playing for high-scores, there’s not a great deal of ways to mix things up. And herein lies Lotus Turbo Challenge’s only real weakness; it lacks a means of ensuring long-term play. 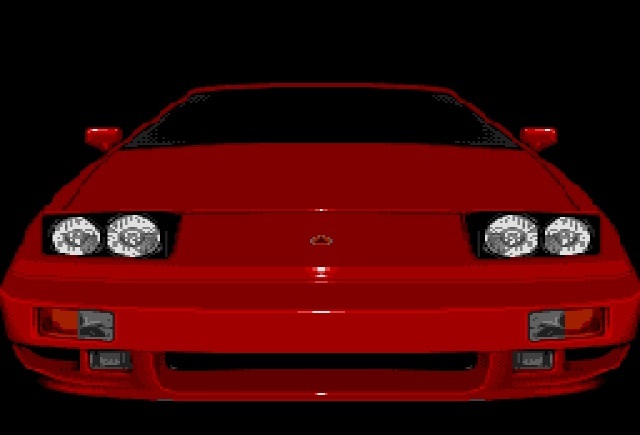 Admittedly, this is something that was brought into sharper focus in its own sequel Lotus II RECS and the excellent SNES racer Top Gear which uses the same engine (and borrows some of the soundtrack). Both would subsequently offer tournaments that involved battling competitors and not just the clock, as well as adding significantly more circuits, and pit-stops, which by-association made the two-player considerably longer-lived too. Despite what some of the pretty attract scenes suggest, there’s only a pair of Lotus’s to drive (lovely as they are) and no selection option, with levels alternating between the strikingly similar white Esprit and white Elan, sans roof. Nevertheless, it’s one of the finest racers of its time. 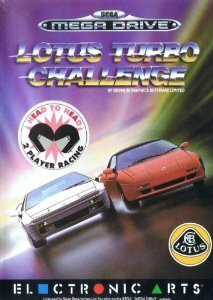 Lotus Turbo Challenge may not provide the kind of mileage you’d want from a console racer, but with a fun two-player mode, fantastic circuits and all-round excellent presentation, it’s aged well and remains mighty playable to this day. 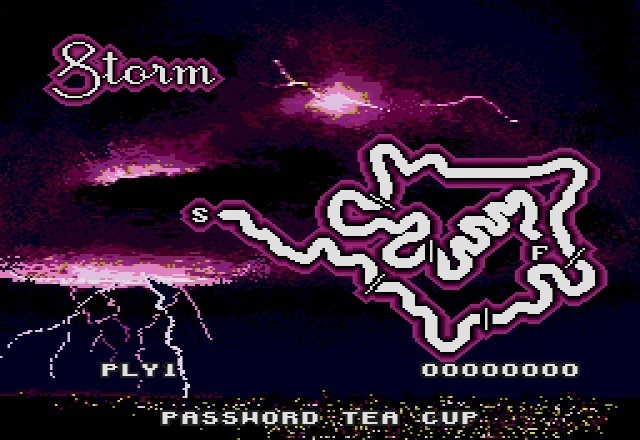 For those who believed the Mega Drive lacked for decent racers, Magnetic Fields' thrill-ride offers another compelling piece of evidence to the contrary.